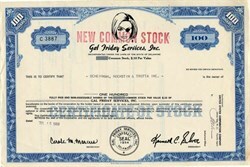 Beautiful uncancelled certificate from the Gal Friday Services, Inc issued in 1969. This historic document was printed by Security-Columbian Banknote Company and has an ornate border around it with a vignette of the company logo. This item has the printed signatures of the Company's President and Secretary and is over 44 years old. Gal Friday Services, Inc. sold franchises for temporary help services. Sometimes Offensive. a woman who acts as a general assistant in a business office or to an executive and has a wide variety of especially secretarial and clerical duties. In 1932, Walter Winchell column which ended with "your gal Friday" referring to a secretary.